Manufacturers are saying they are turning to business intelligence solutions for new ways to better serve customers. That's what 43 percent of survey respondents recently told Aberdeen Group. 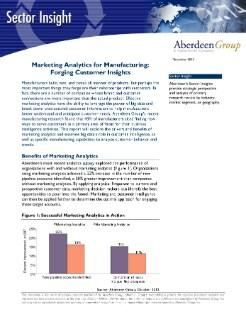 This SAS-sponsored report examines how marketing analytics is being used in these efforts and the role of big data in customer intelligence gathering activities aimed at better understanding customer behaviors and trends.